The licensee is a blockchain casino called Edgeless. Benefits that the licensed blockchain casino will enjoy in the Curacao jurisdiction offer a blueprint of the benefit and purpose of blockchain licenses in general. These benefits include access to the gambling market; increased credibility within the industry; secure partnership with exchanges; new levels of access to banking services, payment providers, affiliate and media networks and many more. Licensing of blockchain means that specific values and benefits will arise in seeking those licenses as well. This essential licensing measure paves the way for effective cooperation with legal authorities in any jurisdiction to support business growth integrating key areas such as crypto and gambling. 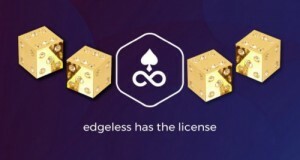 Based in Lithuania, which in-and-of-itself is becoming something of a hot bed for crypto-development, Edgeless values the Curacao license as an effective starting point for a new way to compete with traditional online casinos, with the crypto and gambling fields continuing to rapidly evolve from a regulatory standpoint. Edgeless intends to duplicate the feat as an expansion process by focussing its legal team on other jurisdictions where it is looking to compete, and leading with blockchain to provide those services. The licensing comes just in time for the launch of Edgeless 0.2, which promises increased betting limits; new player registration and verification; deposits and withdrawals of real EDG; and shapeshift integration allowing players to deposit EDG using other cryptocurrencies. First-hand information regarding the new license and Edgeless features will be available at one of the many discussion panels on the future of gambling at ICE London 2018. Perhaps the key benefit of Edgeless is complete transparency, which will be optimised when Edgeless joins the Ethereum network later this year to all but eliminate the possibility of cheating, in an environment where large schools of thought have arisen among online players regarding how to gain advantage in the online domain, as a sort of algorised form of card-counting, which is virtually impossible with gains minimised in a decentralized network such as Ethereum. The world still has a lot to learn about blockchain, but there is a sense that licensing of blockchain casinos will provide a system for, beyond just validation and credibility, evidence-based models for effective adaptation of blockchain to online jurisdictions. Add to this effective further familiarization and integration of cryptocurrency into more transactions quantitatively which in turn has to reflect positively on the overall value of cryptocurrency in general. If the value of cryptocurrency strengthens, then the value of the entities online that support cryptocurrency such as first and foremost casinos can also increase commensurately.